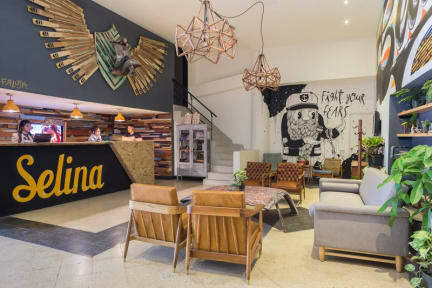 I’m always impressed by Selina hostels. They give off such a great vibe and their staff was super sweet! The vibe at this hostel had more co-working going on but had a great bar hang out area. The coffee was delicious too and great price! 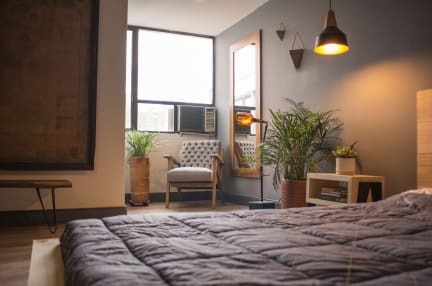 I stay at Selinas every city I visit in South America at least for a day because I love the interior design and the atmosphere. In Medellin I didn't find the rooms special at all compared to Rio for example and the bathroom wasn't very clean. But my biggest issue was the noise from outside (the hostel is situated by a busy highway) and the noise from the bars downstairs/outside. There was also no A/C in the room. These two factors affected my sleep. But I loved the common areas and the space. Another great Selina hostel. Nice rooms, clean bathrooms, well equipped common kitchen, and nice common areas. Nice bar but drinks are quite pricey outside of happy hour, however located in a good area close to a lot of bars/restaurants. Quite a long walk to metro station. First off love the Selina experience but can’t say this was my favorite location because of the cleanliness. The staff was amazing and accommodating!! Not all the mixed dorm rooms had proper fans which was a shame but everything else was great. The location was perfect and 24 hour security. The private room was not as smart as it appeared to be online. The air conditioning unit also didn’t work. That said, it was clean and well located. The staff were helpful, but when we asked a question about a long taxi journey they practically laughed in our faces making us feel embarrassed for even asking. In addition, we forgot to collect the key deposit when leaving and the memeber of staff didn’t remind us. I can’t imagine he forgot, as this is his job, so it was disappointing. I enjoyed the Selina bar area however the actual accommodations we're less than ideal. I paid for an individual room so I could get some good sleep yet the hall noise and the noise from the bar would wake me up. My room and the bathroom also had mold in them, so they need better ventilation. Seriously overrated. I checked out a day early. They do have nice graffiti on the walls though. But then that’s not the reason you stay here. The barista for the weekly coffee workshop didn’t show and the rest of the staff knew nothing of it. No air conditioning in the room. Rooms seriously dated and nowhere near expectations. Just a massive let down.